The Wet Tropics Management Authority (WTMA) have asked TREAT to plan and develop a Visitor Interpretive Centre in the new office and training complex to be constructed shortly at the Lake Eacham Nursery - now known as the "Centre for Tropical Restoration" (CTR). To do this, a grant of $55,000 has been provided by WTMA and we have set up a working party headed by our President - Barbara Lanskey. WTMA has chosen us to create the centre because -as they say, the unique partnership of TREAT and CTR has become a source of reputable rainforest restoration information, which attracts visits by local residents, schools, universities and tourists. It is hoped that in the future the centre will become the Tablelands point of contact for community based environmental education. Like all the other 16 interpretive centres set up by WTMA around the wet tropics region, the TREAT centre will have a theme this is to be Tropical Rain forest Restoration, which of course is exactly what the partnership of TREAT and CTR have been doing for the past 20 years. The interactive interpretation material and displays will focus on this theme and tell the story of the Tableland rainforests, from their removal for farming in the past to their partial restoration today. We are pleased to have been given the opportunity to tell this story. The 20th TREAT AGM will be held at 6:30pm on Friday 23rd August in the Community Hall, Yungaburra. Formed in 1982, this, the 20th AGM, is in fact our coming of age - our 21st anniversary! It is hoped that as many members as possible will attend for this auspicious and significant occasion. A substantial (finger food) supper will be provided by our catering volunteers. 6.30pm - Annual General Meeting. Reports by the President, Treasurer and CTR Manager. 7.30pm - "20 years of TREAT" (MC: Barbara Lanskey). As part of each primary school's TREAT on TAP program, the students visit the Centre for Tropical Restoration. The bus hire is paid out of the National Heritage Trust grant. The students also receive a school session where they, gain an appreciation of what TREAT is about and why we are focussed on planting trees. The nursery visit supplies the know-how of our preoccupation. They learn from Syb Bresolin and Warren Canendo and volunteers how trees are raised. The students love potting up seedlings and getting seeds out of fruits; if only all education could be so practical and enjoyable! Our videos, 'TREATWISE' about our activities and 'TREAT yourself about the way to plant trees, are important parts of the sessions with the students. A special part of their visit is the walk in the rainforest with Syb and Warren, where they tell the students about Aboriginal life in the forest. It is a revealing experience to stand among the trees near Lake Eacham and visualise what life must have been like when you got all the things you needed from the forest. The students have difficulty imagining a pre-consumerist society! TREAT volunteers and staff from CTR planted approximately 4,000 trees on the banks of the upper North Johnstone River adjacent to the Malanda Pound on 16th March. This project is part of a long term project to prevent further degradation of riverine areas along parts of a 5km stretch in the upper reaches of the river, mostly in and adjacent to the town of Malanda. Site preparation presented a significant challenge due to the occurrence of many Camphor laurel trees (both large individuals and dense clumps). CTR staff put in a huge effort in the week prior to planting, cutting down and applying herbicide to these and other weeds, stacking debris for removal and digging holes. Camphor laurels are a serious weed along watercourses in many areas of the Tablelands often forming mono-specific stands, out competing native trees and seedlings. Complete removal of dense infestations along creeks can be problematic. Removal of debris remaining after cutting down large trees and thickets can be difficult. Steep banks are often inaccessible to the machinery needed to remove large woody debris. Hauling out this material by hand may not be possible or practical. Debris, if left within the watercourse, may impede water flow, cause erosion and destabilise banks. Applying herbicide to mature standing trees, while killing the tree and removing a weed seed source, may also ultimately lead to large quantities of woody debris within the watercourse. Where it is possible to use machinery, the resulting disturbance associated with complete removal may also destabilise banks. Hence, complete and immediate removal of camphor laurels may not always be possible, practical or desirable. Each site must be assessed and appropriate options considered and applied. A combination of techniques may be required, with some also advocating the strategic placement of strangler figs in the forks of large camphor laurels leading to a gradual and more benign replacement with native species. Easter weekend saw a fitting end to this year's TREAT community plantings on the Tableland with a strong turnout at Warren Guidice's property. Almost 70 volunteers braved the warm conditions to plant 3500 Mabi trees along the Barron River upstream of the Jim Chapman Bridge. With continued landholder and community support, this project aims to strengthen vegetation linkages, reduce bank erosion and improve water quality along the Barron River. In total, 7 community plantings were staged by TREAT and CTR across the Tablelands this season - a record effort. Another 6000 trees extended the Peterson Creek Linkage, moving the project closer to completion of a continuous vegetation corridor between Lake Eacham N.P. and the Curtain Fig S.F. As part of the East Evelyn road upgrade, 4000 trees were planted in strategic locations including a number of fauna underpass entrances and the retained McHugh Lookout. Almost 1000 Eucalyptus grandis (Rose Gum) were mixed through previous plantings at Massey Creek, part of the Tully Gorge N.P estate. This particular species aims to complement existing work by adding a wet sclerophyll component which is represented in adjacent remnant forest. In a new collaborative project, TREAT, the CTR and Eacham Shire Council prepared and planted a section of the Johnstone River adjacent to the shire pound. Clearing exotic species like Camphor Laurel and privet paved the way for 3000 native rainforest trees, which will certainly convert the area a high value public asset for nature appreciation. Linking in with the Mabi Recovery Plan, 3000 trees were planted adjacent to a substantial remnant off Pinnacle Pocket Road. A further 1700 hundred were established on Mazlin Ck on the northern side of Beantree Bridge. This planting complements previous work both upstream and downstream and increases the treated area along Mazlin Ck to almost 1.3km. Across all 7 projects, TREAT, the CTR and members of the community were successful in planting nearly 23000 trees - Congratulations to all! While on the subject of plantings, the Centre is about to wrap up another extremely successful program on member's properties. Almost 3500 trees have been planted on local TREAT member's properties. The CTR extends gratitude to all landholders for their cooperation and a particular thanks to the committed planting crew who made it all possible by volunteering their time and effort on Friday mornings. Staff at the Centre are to be congratulated for their efforts preparing and presenting community planting sites this season. Their commitment was complemented by the community support for all plantings. Ryan Wolfe and Lenny McKay completed their traineeships in March with Ryan maintaining his employment while Lenny has moved on to bigger and better things Congratulations and well done to both. The Centre welcomed Mr Angelo Salerno to the ranks in March. Angelo is from Mareeba and will be responsible for management of facilities and grounds. With the new building imminent, Angelo will have his work cut out shaping and maintaining the new additions. Angelo brings a wealth of experience which he is keen to offer and ready to apply, in fact it has been difficult to miss Angelo's work and personal touches! February and March saw Syb Bresolin and Dianne Drake developing training material for Indigenous training. The Cooperative Research Centre (CRC) provided funding for Research Technician training with the aim of creating interaction and understanding between Traditional and Western Science. Peter DeIlow, Warren Canendo and Nick Stevens assisted with final preparation and course delivery. See Syb's write up for more detail. The CTR hosted an international guest from Indonesia during a fortnight in March. Mr Agustinus is the senior rehabilitation officer for Kelian Equatorial Mining in East Kalimantan. Mr Agustinus spent his visit working with staff and TREAT members to learn how to involve local communities in rainforest rehabilitation. His visit was a valuable experience because of the unique relationship between government and community. Patrick Sutton is our new student from the US based School for International Training. Patrick's project involves monitoring the numbers of fruit eating birds at the Donaghy's and Petersen Creek corridors. Patrick will give members a summary of his results during smoko Friday May 10th at the CTR nursery. Imagine a darkened concert hall with candles, colours and flashing lights, packed with people from babies to seniors. The picture in your mind resembles a TREAT benefit concert and an unusual event at that. On Saturday March 16th, Carinda Christy form Cairns with supporting singer Kate Finkelstein, gave a concert in the Malanda Hotel to a packed house. TREAT members, families and young people, including School for Field Studies students enjoyed the modern music of the two talented young women. Jodi Kohler told the audience about TREAT and a small stall brought in a proportionate sum. Carinda Christy conceived the idea of having a benefit concert for TREAT. This produced $755 for us and the welcome sum will boost our Environmental Benefit Fund. Many thanks to Carinda, Kate and their supporting team, and also to Mr Tom English for complementary use of his hall. Harpullia rhyticarpa (Sapindaceae) is a slender tree which is very suitable as an ornamental for home gardens and planting as a tree to occupy understorey situations in revegetation of 1b ("Hypsi Forests") and 5a forest localities. The species grows in wetter rain forest communities in lowlands and highlands, on a wide range of soil types. It appears absent from the true Mabi (5b) rainforests that occur between Yungburra, Kairi, Wongabel, Atherton and Tolga, although it has been recorded from the riparian Mabi remnant on Nicholas Creek, on the eastern side of the Atherton-Malanda Road (Beatties property). This locality edges a southern margin of true Mabi forest. Forests on basalt soils, southwest, south and east of this area grade into 5a and lb communities, reflecting a higher annual rainfall gradient. Rhyticarpa means wrinkled fruit and when capsules dry they are supposed to wrinkle but the evidence is not convincing. H. rhyticarpa grows up to 7 metres tall but mostly is a slender shrub 2-5 m high. Currently it is flowering and fruiting. Flower branches (inflorescences) form slender weeping curtains, 50-90 cm long, of fragrant goblet-shaped cream flowers (ca. 9 mm long, 10 mm wide) which turn pink as they age. The sides of the goblet (calyx tube) are fawn green. The goblet rim show cream and pink petals. A number of these flowers develop into beautiful peach-coloured fruit capsules, 15-25 mm long, 30-40 mm wide that consist of two lobes with up to two seeds per lobe. Each shiny brown-black seed is completely or partially enclosed with a red or yellow fleshy aril. Capsule, aril and seed are not edible for humans but birds and rodents disperse seed. Seeds are likely to germinate within 40 days. Leaves are alternate, compound with 8-14 glossy green alternate to some opposite leaflets. Often the rachis (mid stem of compound leaf) is winged to just below the basal pair of leaflets. The conspicuous two lobed capsules which have tiny star-shaped hairs distinguish the genus Harpullia from other Sapindaceae. 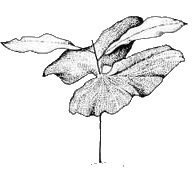 H. rhyticarpa is distinguished from other harpullias by the rachis wings not extending down to the base of the leaf stalk (petiole) as in H. frutescens. Leaves of H. ramiflora have very rounded leaf stalks, 4-6mm wide and leaflets 10-40 cm long compared to leaf stalks 2-3.5 mm wide and leaflets 6-20cm long in unwinged leaves of H. rhyticarpa. In H. pendula there are 4-8 leaflets, leaf stalks are 2-3.5 mm in diameter and the main lateral veins are not raised on the upper surface of leaflets whereas they are raised in H. rhyticarpa. Beautiful illustrations of the fruit can be seen in Bill and Wendy Coopers' "Fruits of the Rainforest", p.160. Planted seedlings can survive in the Yungaburra to Atherton region without tender loving care. On Easter Saturday, down by the Barron River, some enthusiastic volunteers helped make the seventh and final community planting for the season a great success. This is a brand new NHT funded project on Warren Guidices' property near Picnic Crossing Road. Around 3000 trees were planted and watered in, on half a kilometre stretch of the west bank of the Barron River. This planting extends a pilot project area planted in early 2001 by TREAT Friday volunteers. A small remnant of rare Mabi or Type 5b rainforest still exists on the site and the planting used species found naturally in this forest type. Looking to the future this project has the potential to be the humble beginnings of an exciting and ambitious Mabi corridor along the Barron River between the remnants at Wongabel and Picnic Crossing. Members might like to visit some of the early plantings of twenty years ago, when TREAT first started. In thse days there were no grants available for tree planting and no Lake Eacham nursery. Geoff Tracey and Tony Irvine were able to supply the first modest batches of trees from their own nurseries. You will find the very first planting on the Tinaburra peninsula near Yungaburra. Both founders, Geoff Tracey and Joan Wright, lived in Yungaburra. The ugly but useful toilet block near the launching ramp boasted a row of steel railway lines, driven into the ground to stop people driving their cars over the turf. We planted Callistemons and Syzygiums between them and the resulting sturdy plants still do a good job of beautifying the area. Some members may remember a debate about big street trees (Bunya pines) in Yungaburra in the '80s. After a Bunya pine had been felled outside the front door of the Lake Eacham Hotel, TREAT got permission to replace it with a shady fig. One memorable day the whole Yungaburra school marched down the hill and, sitting on the warm bitumen, heard Tony explain about tree planting. Councillor Tom Bethell, who was a keen member of TREAT, planted the little Benjamin fig tree, and Joan suggested that the children say 'Hello Little Ben' as they passed. Cars are regularly parked under it now. A long lasting lesson about plot management was learnt from an early planting at Halloran's Hill park in Louise St, Atherton. The council workers slashed the long grass near the creek just over the little bridge near the play ground. Then we planted a number of Geoff and Tony's trees in the area which had once been planned as a botanical garden. There were no strong, expert people to keep the grass down in those days and the little trees were very nearly swamped by the rank growth. Hence the lesson. They are fine, tall trees now beside the path which passes the small Carinya houses. When TREAT received its first grant ($1000) we had a special water tank made to fit on a trailer. James and I used to water the wind-row trees planted at the Yungaburra end of the Tinaburra peninsula. One day we were towing it to Atherton and as we passed the Curtain Fig Tree forest, it fell off the trailer and bounced noisily down the road! It was lucky the road was empty. That tank was last seen in retirement behind a shed at the Lake Eacham nursery. In TREAT's early days, Elaine and Henry Tranter organised a regional group in Millaa MiIlaa and hundreds of trees were planted by that group. Possibly the largest planting was established on an empty piece of land beside the Elinjaa Falls rainforest. The same species were chosen as the original forest, according to TREAT's motto 'The right trees in the right place', and now the forest is almost indistinguishable from the original. The Lake Eacham nursery was built in 1983, but it was only small, perched on a slope behind the National Parks workshop. Ros Robb was the first nursery person and a little later Nigel took over. The long cooperation between Nigel, TREAT and the nursery has been productive of thousands of rainforest trees and many hectares planted for the benefit of the land and the local wildlife. Between the 3rd -9th April, a Train the Technician school was held for indigenous trainees in a residential at the Genazzano Centre. Participants in this workshop were Traditional Owners from various communities within the southern and northern regions of the Wet Tropics. A 70 page Resource Workbook was produced for this Rainforest CRC funded project. Dianne Drake put many volunteer hours into the workbook's production along with Nigel Tucker and Nick Stevens. Warren Canendo and Helen McConnell contributed some deadly cover artwork. Special thanks go to Peter DelIow who worked many hours writing, formatting and producing a book that we are all very proud of. Peter Dellow, Warren Canendo, and Syb Bresolin delivered the theory side of the training, assisted in the field by Peter Snodgrass and Jeff Onus. Altogether this one was truly a team effort. Participants learnt a range of skills which included; using a compass, setting up a vegetation transect line, setting out an animal trapping quadrant using different types of cages, handling small mammals, gathering and recording information along the transects, analysing collected data, photo-point monitoring, and plant pressing. This training had been well received by the participants who gave positive feedback. We've applied for funding from the Rainforest CRC to continue and expand this project.